We just returned from a two week trip to Taiwan, an island off the coast of China. Tony’s parents originally were called to work in China, but when the Communists took over just a few weeks after they arrived, they moved to Taiwan where Tony’s father, a doctor, opened a clinic. Tony was born in the capital city of Taipei and lived there (with a few years break at a British boarding school) until he was seventeen. So our family has many natural ties to the island. Taiwan is a small, mountainous island that has transformed itself into a first world nation over the past couple of decades. It is very beautiful; the people are friendly. The main religion is Buddhism/Confucianism. We were invited to speak to the Taiwan Missionary Fellowship, a group that involves nearly all the missionaries on the island. Well over 50% of the missionaries were there, and despite a huge variety in theology and church backgrounds, there was a sense of unity and a desire to work together across all the mission groups and churches. Even though Taiwan has a very traditional missions history, and the vast majority of the churches there are based on a Western model, there was great openness to our message that could have been both threatening and controversial. Our main teaching for the five days we were there was on following the Holy Spirit into the harvest and bringing the new disciples together in small groups/churches. It seems that right across the board, many missions groups recognize that traditional patterns of church planting on the mission field (erect a building and train a pastor) are not just prohibitively expensive, but there are far more effective ways to reach out in today’s world. Some groups we met had already begun to adopt Luke 10 patterns of church planting and many of the others were eager to explore organic principles they could use in reaching out. 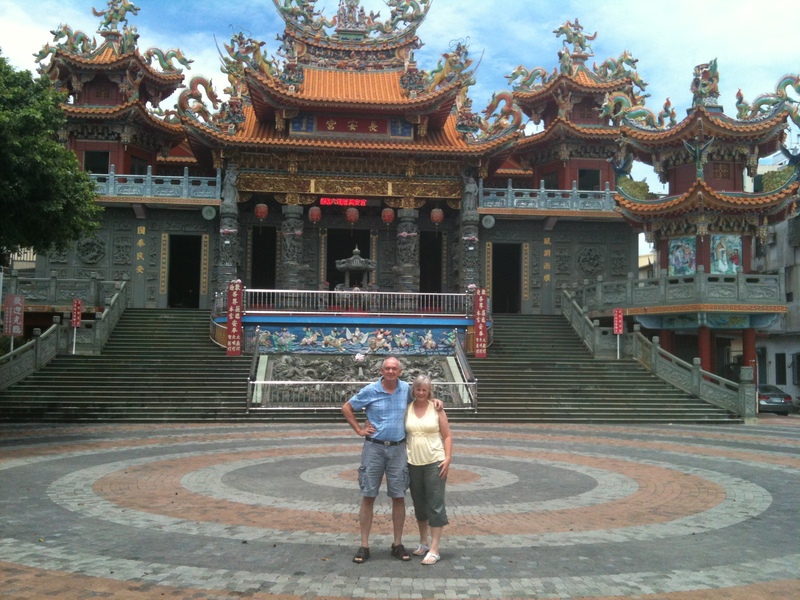 From there we went to a much smaller city in the south of Taiwan where we spoke in a traditional Baptist church. Again, our message was on being willing to trust the Holy Spirit as he leads us outside the walls of our church to reach out to a world that desperately needs him. The lady pastor, who has been at the church for only three years and has already seen the church more than tripled in size, was so hungry to learn more. Again, she was open to non-traditional methods in reaching out to the world around her. Following this we had a couple of days at the beach, and then back to Tony’s old school–Morrison Christian Academy, which his parents helped to found, for its 60th reunion. This school has been a huge support to the missionary community, but may now be moving into its most effective phase. It has a vision for training up the next generation of Taiwanese leaders. Here is traditional missionary work at its best. Two things strike me from our trip. The first is that Taiwan is unusual; I don’t think I’ve ever before come across such a high degree of unity and collaboration within the missions community of a nation. We know that God has commanded his blessing where there is great unity. Who knows what God might do there. The potential is enormous. The second is that God is up to something, not just in Taiwan, but in many other nations too. In several of the nations we have visited recently, there’s a renewed sense of anticipation, an expectation that God is about to move in ways they have only dreamed about. As missionaries adopt new patterns of making disciples, remaining only on a very temporary basis with any new church and training local people in principles of church planting movements and releasing them to do the work, God is moving in powerful ways. I was a short-term missionary (2years) in Taiwan in the mid-80’s. The missionary community worshiped and worked together. It was quite refreshing. I also taught at Morrison Academy in Kaosiung. I truly treasure my experience there. Did you come across Tony’s parents while you were there (Donald and Penny Dale)? We love the sense of community they have at the school. The whole missionary community is very unusual in their sense of unity and co-operation.